It is likely that you have heard about the Waterpik® Water Flosser but now is your chance to have a closer look and give it a try. Take this opportunity to arrange a Waterpik® Lunch and Learn at your practice and gain 1 hour verifiable CPD – we have a team of Professional Educators waiting to hear from you. Click here to request a Lunch and Learn now. Our friendly Professional Educators are all UK based clinical practitioners, and like you, are committed improving the oral health of the nation. They cover a variety of areas and would love to visit your practice and bring lunch for you and your team! Here, you can gather first-hand information and watch a demonstration of the Waterpik® Water Flosser at your convenience. You will be able to see all the different tips and models that are available and take a look at the extensive body of research and clinical evidence behind water flossing technology. Annastasia Kellett Wright – covering south London and the southwest greater London area. 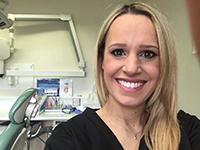 Annastasia qualified as a Dental Hygienist and Dental Therapist from the University of Sheffield in 2013. She has practised in Cambridge and London and has experience working with both adults and children. Annastasia is passionate about her work, whether she is cleaning teeth or teaching patients how to better look after their teeth and gums. She has a strong interest in whitening teeth and improving patients' self-confidence but she also enjoys working on complex gum therapies. She regularly invests in post-graduate training and likes to keep up to date with all the latest dental developments. 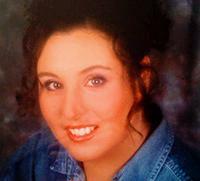 Mireille is a qualified Dental Hygienist from North Durham. She completed her Dental Hygienist training in the Royal Army Dental Corps in 1991 and was appointed President of the Hong Kong Dental Hygienist Association in 1995. Mireille has worked in private and independent practices in the UK, USA and the Far East and has a keen interest in treating nervous and phobic dental patients. She is currently part of a dynamic team of experienced practitioners teaching students clinical skills in Dental Hygiene & Therapy at Teesside University. Away from dentistry, Mireille lives with her two teenage sons and a very large dog. She is a pilates practitioner and also has a special interest in complementary therapies and mindfulness. 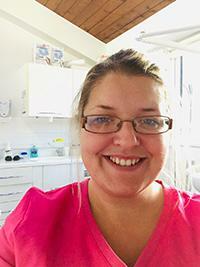 Jo qualified from the university of Sheffield in 2013 with a distinction in Dental Hygiene and Therapy. Prior to this she gained a degree in Psychology and worked both as a Dental Nurse and Oral Health Educator. She loves working with different people and motivating them to improve their oral health. Jo has worked in a variety of different settings since qualifying, both NHS and private. 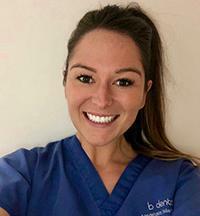 She has recently joined us at Waterpik® and is keen to take on this new challenge alongside her work as a private Hygienist. Hannah began her career in dentistry 15 years ago as a Dental Nurse and qualified with the Gold Award after being recognised as the most outstanding candidate in the country in 2004. She went on to complete her diploma in Dental Hygiene and Therapy with distinction from Bristol Dental School in 2009. She has since worked in various practices in Bristol and Somerset and has developed a keen interest in working with nervous patients. She is passionate about helping them to feel more comfortable in the dental environment and finding new methods or techniques to achieve the best oral health standards possible. Away from dentistry, Hannah is kept busy with her two young children and managing a beautiful holiday let in the New Forest. She also loves to travel and is a keen cruiser! 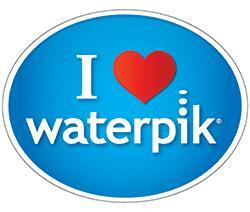 Waterpik® has a Professional Educator in your area too! Click here to request your Lunch and Learn TODAY!. Waterpik® works with Professional Educators up and down the UK and continues to grow. If you are a practicing Dental Hygienist or Dental Therapist with at least three years clinical experience, why not come join us? Please Contact: Charlotte.Gowers@churchdwight.com for further details.